(Francisco Kjolseth | The Salt Lake Tribune) Bryson LaBar, left, a.k.a. 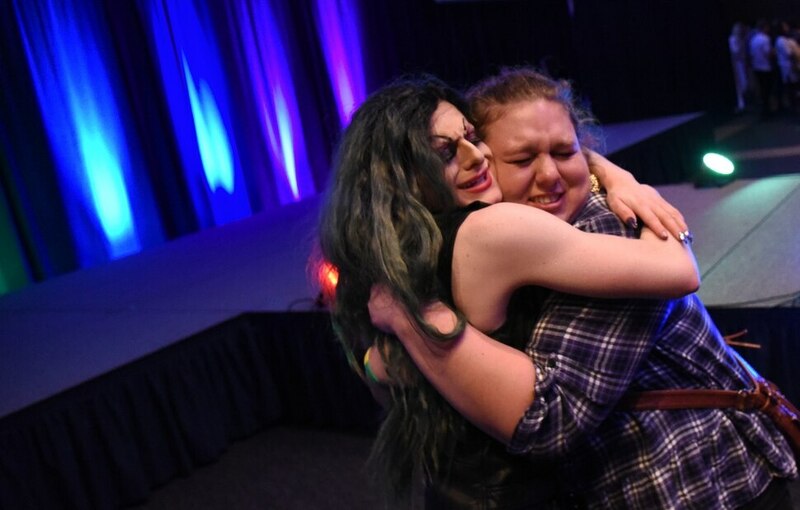 Madame LaCrude, gets a big hug from Larissa Washburn following his drag queen performance at Utah State University. (Francisco Kjolseth | The Salt Lake Tribune) Alexis Cooper, a Utah State University student who won the Miss USU pageant competition last year, gets the crowd excited for the schools very first drag show recently. With a spirited presence, Cooper played the role of Adonis as the emcee to a packed ballroom at the Taggart Student Center, introducing ten drag queens and kings to a friendly and excited crowd. 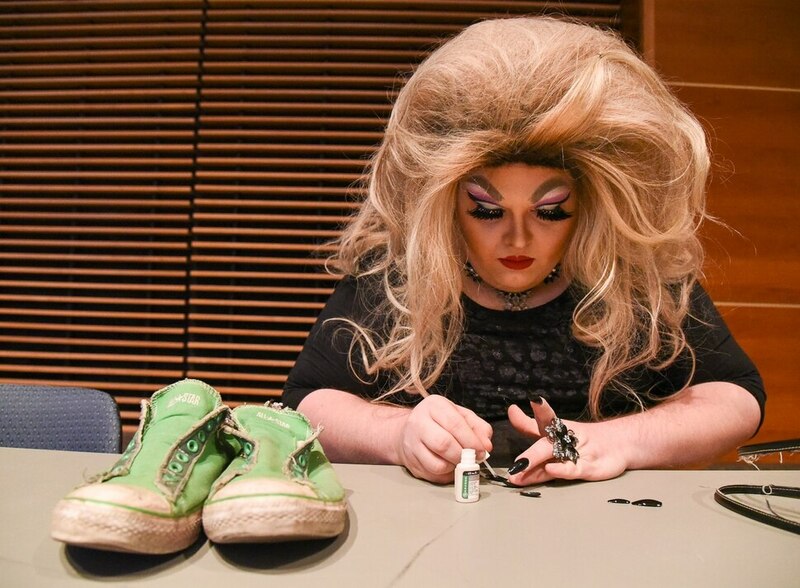 (Francisco Kjolseth | The Salt Lake Tribune) Tyler Jones presses on his nails after hours of preparation to become Anya Bacon for Utah State University's very first drag show recently. Filling the Taggart Student Center ballroom to capacity, Bacon and nine other drag queens and kings entertained the friendly crowd. (Francisco Kjolseth | The Salt Lake Tribune) Alexis Cooper, a Utah State University student who won the Miss USU pageant competition last year, works on her makeup to become a drag king to host the schools first drag show recently. With a spirited presence, Cooper played the role of Adonis as the emcee to a packed ballroom at the Taggart Student Center, introducing ten drag queens and kings to a friendly and excited crowd. (Francisco Kjolseth | The Salt Lake Tribune) Bryson LaBar, a Utah State University theatre student finishes his transformation into Madame LaCrude before USU's first drag show recently. (Francisco Kjolseth | The Salt Lake Tribune) Tyler Jones who's drag queen name is Anya Bacon, gets a large supportive crowd cheering as Utah State University host its first ever drag show. (Francisco Kjolseth | The Salt Lake Tribune) Jared Espiritu who goes by his drag name Aliyah, gets sassy on stage as he answers crowd questions following a drag queen performance at Utah State University. (Francisco Kjolseth | The Salt Lake Tribune) Alexis Cooper, a Utah State University student who won the Miss USU pageant competition last year, gets the crowd excited for the schools very first drag show recently. With a spirited presence, Cooper played the role of Adonis as the emcee to a packed ballroom at the Taggart Student Center, introducing ten drag queens and kings to a friendly and excited crowd. (Francisco Kjolseth | The Salt Lake Tribune) Kyel Beardall, prepares his wig as he takes on the persona of Emerald Fantom Daa for Utah State University's first drag show recently. 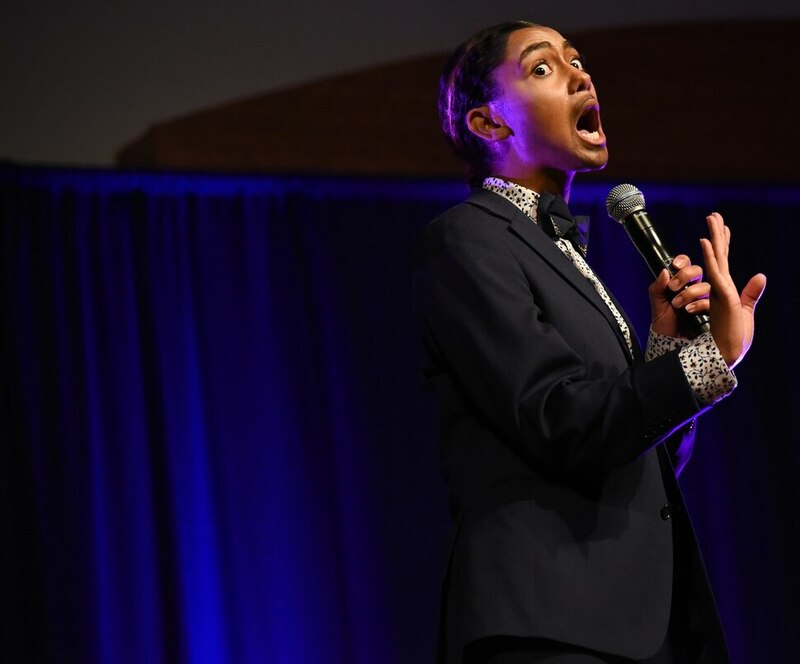 (Francisco Kjolseth | The Salt Lake Tribune) Bryson LaBar, a theater student at Utah State University entertains a large crowd gathered at the Taggart Student Center ballroom as Madame LaCrude recently. USU hosted their first ever drag show recently as ten drag queens and kings put on spirited and creative performances. (Francisco Kjolseth | The Salt Lake Tribune) Hundreds line up outside the ballroom at the Taggart Student Center at Utah State University recently to catch the school's first ever drag show. Filled to capacity, ten drag queens and kings entertained the friendly crowd. (Francisco Kjolseth | The Salt Lake Tribune) Neil Betty dressed as Betty î puts a unique twist on his drag queen performance as he lip syncs speed metal during Utah State University's very first drag queen show recently. (Francisco Kjolseth | The Salt Lake Tribune) Jake Hogan lips syncs through a number of short musical numbers as Nancy Raygun, his drag queen persona during a number of spirited performances by drag queens and kings at Utah State University recently. (Francisco Kjolseth | The Salt Lake Tribune) Kyel Beardall lights up the stage as Emerald Fantom Daa before a packed ballroom at the Taggart Student Center at Utah State University recently. The university hosted it's first ever drag queen show, with participants excitedly exclaiming it marked Logan, Utah's fourth ever with hopes for more. (Francisco Kjolseth | The Salt Lake Tribune) Madame LaCrude drag queen Bryson LaBar, left, and emcee Alexis Cooper, both students at Utah State University, get ready to go on stage for the schools very first drag show. (Francisco Kjolseth | The Salt Lake Tribune) Jared Espiritu, who goes by his drag queen name Aliyah, does a toe touch in heels before a large crowd at Utah State University, hosting their first ever drag show recently. Espiritu who lovingly calls his mannequin head Ornacia, put on an athletic and spirited performance as the crowd cheered him on. (Francisco Kjolseth | The Salt Lake Tribune) Jared Espiritu, who goes by his drag queen name Aliyah, throws bills into the air being presented by fans as Utah State University, hosts their first ever drag show recently. Espiritu who lovingly calls his mannequin head Ornacia, put on an athletic and spirited performance as the crowd cheered him on. (Francisco Kjolseth | The Salt Lake Tribune) Ell Tingey, dressed as her stage name Nathaniel Jackson, lip syncs Frank Sinatra's New York, New York as Utah State University hosts their very first drag show recently. (Francisco Kjolseth | The Salt Lake Tribune) Utah State University volunteers hand out rainbow stickers as they welcome people toe the university's very first drag queen show recently. (Francisco Kjolseth | The Salt Lake Tribune) Ross Graham Wood who goes by Lizzie McQueen when he is on stage as a drag queen, takes to the stage in a full house as Utah State University hosts its first ever drag show. (Francisco Kjolseth | The Salt Lake Tribune) Macey Keith as Marlone D. gets the crowd moving during a drag queen and king show at Utah State University. (Francisco Kjolseth | The Salt Lake Tribune) Tools of the trade backstage, drag queens and kings apply their makeup for Utah State University very first ever drag show recently. (Francisco Kjolseth | The Salt Lake Tribune) Bryson LaBar, a theater student at Utah State University entertains a large crowd gathered at the Taggart Student Center ballroom as Madame LaCrude recently. USU hosted their first ever drag show recently as ten drag queens and kings put on spirited and creative performances. (Francisco Kjolseth | The Salt Lake Tribune) Drag queens and kings sit on stage during a post performance panel discussion before a packed ballroom at the Taggart Student Center at Utah State University. (Francisco Kjolseth | The Salt Lake Tribune) An audience member kicks his heels into the air as a large crowd awaits the start of Utah State University's very first drag queen show recently. (Francisco Kjolseth | The Salt Lake Tribune) Kyel Beardall lights up the stage as Emerald Fantom Daa before a packed ballroom at the Taggart Student Center at Utah State University recently. The university hosted it's first ever drag queen show, with participants excitedly exclaiming it marked Logan, Utah's fourth ever with hopes for more. (Francisco Kjolseth | The Salt Lake Tribune) Tyler Jones, who recently organized a Halloween-themed drag show featuring performers from all over Cache Valley, talks about the hours of preparation to become Anya Bacon, including three layers of eye lashes. Jones and nine other drag queens and kings performed during Utah State University's first ever drag show recently. (Francisco Kjolseth | The Salt Lake Tribune) Tyler Jones as Anya Bacon, left, gets a little help with his hair by Kyel Beardall, who goes by Emerald Fantom Daa, before both going on stage for Utah State University's first drag show recently. (Francisco Kjolseth | The Salt Lake Tribune) Kellin Rosillo performs an original song as people light up their phones and cheer her on during Utah State University's very first drag queen show. (Francisco Kjolseth | The Salt Lake Tribune) Ell Tingey, dressed as her stage name Nathaniel Jackson, lip syncs Frank Sinatra's New York, New York as Utah State University hosts their very first drag show recently. (Francisco Kjolseth | The Salt Lake Tribune) Macey Keith as Marlone D. gets the crowd moving during a drag queen and king show at Utah State University. She danced toward the stage, lining up behind the black curtain, and when her name was called, strutted out to lip sync to her favorite Lily Allen song: “F You.” And while it was fabulous and a little bit frisky, the performance was also historic. It was the first time Utah State University, a largely conservative and relatively agricultural school in Logan, has ever held a drag show on its campus. The event, hosted last week by the school’s housing office, featured 10 performers, mostly students, as part of a discussion of drag culture and the LGBTQ community. Those onstage danced, sang and answered questions about what it means to them to perform a gender identity as a drag queen or king. Nearly 1,000 people filled the ballroom of the campus student center to watch, bringing in hundreds more chairs and cramming into the standing room at the back. They shrieked and cheered for much of the two-hour show. A few in the audience kicked up their own heels in support. But it’s been slow to catch on, Jones said, and sometimes hard for this tight-knit community to understand what the form of self-expression is really about. “I identify as male, but I also cannot deny that there is a part of me that I can express as a woman,” he explained. It’s become even more important and more of a challenge, he said, with President Donald Trump in office. During his tenure, Trump has made several attempts to roll back the recognition of and the protections for members of the LGBTQ community, including looking to limit gender based on a person’s genitalia at birth, trying to ban transgender people from serving in the military and challenging their civil rights under the Affordable Care Act. Jones held up a sign during the performance declaring, “We won’t be erased.” It included a drawing of Trump with a red X through his face. The act is as much about politics as it is about gender. Jones got ready backstage with the other performers, the bathrooms bustling with half-dressed drag queens, some wearing more makeup than clothes. Sequined dresses and something described as “a swimsuit with arms” hung on racks ready for the second act. A few performers rehearsed the choruses of Lady Gaga songs. Jared Espiritu, who performed as Aliyah, practiced toe touches in white strappy heels. The nursing student had done drag once before in Logan and wanted to bring more attention to what he says is a marginalized group. In her first act, Aliyah wore a mannequin head — named Ornacia — strapped on top of her own head and a glittery purple cape. Audience members danced in the aisles and threw dollar bills on the stage (which were donated to the local LGBTQ groups in the county). For her second act, she wore a spandex rainbow one-piece and a thick brown wig. The other performers, too, boasted about their outfits. One named Nancy Raygun made a dress out of Christmas sweaters she found at the thrift store. Jones tore up his sofa to create curvy hips. Emcee Alexis Cooper, Miss USU 2018, painted on a beard using a full tube of mascara and an eyebrow pencil. The event made history for Utah State. And honey, it looked good.